Every December, members of the United Chiropractic Association (UCA), including Drs Glenn and Laura, donate a day’s work by providing chiropractic adjustments in exchange for food parcels. 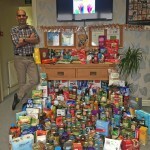 This year, we are supporting Shrewsbury Food Bank PLUS at Barnabas Community Projects. One in five people in the UK – that’s around 13 million – are now living below the poverty line. What this means in practice is that, too often, choices have to made between heating the house and buying food, paying the rent and eating. One in five parents have skipped meals or gone without food so their children can eat. Many people live just one crisis away from having to make these difficult decisions: redundancy, a late benefit payment, an unexpected repair bill, Christmas – any of these things can make the difference between just about scraping through and not being able to afford a trip to the supermarket to buy even the basics. Food banks help families through these difficult times by providing food parcels and they rely on donations to do so. This year, we are proud to be supporting Shrewsbury Food Bank PLUS – a self-funded charity that works with the people of Shropshire to serve the community. For more information about the wonderful work Shrewsbury Food Bank PLUS do, you can visit their website here. We think this is a great project that deserves as much support as it can get. We would therefore love it if you would join us for an adjustment visit on Thursday 1st December in exchange for a £30 food parcel instead of your usual cash payment. Whilst you are here, Tracy & Nancy will have the kettle on for a cuppa, a mince pie and a chance to have a natter. Not only that but, if you have a friend or family member who you think could benefit from chiropractic, from 28th November to 2nd December 2016 we are offering any new patients an initial consultation in exchange for a £30 food parcel. This will save anyone you refer £15 as well as allowing them to help someone else this Christmas. Finally, even if you are not booked in on 1st December, you are also very welcome to donate and we will gladly pass your donation on to the food bank. With your help, we will be supporting some of the most vulnerable people in the local area this Christmas. To book your visit on 1st December, just give us a call on 01743 588190.